In the backend of Joomla! use either Menus -> Menu Manager or the icon Menus from the controlpanel. Modules Linked to the Menu. 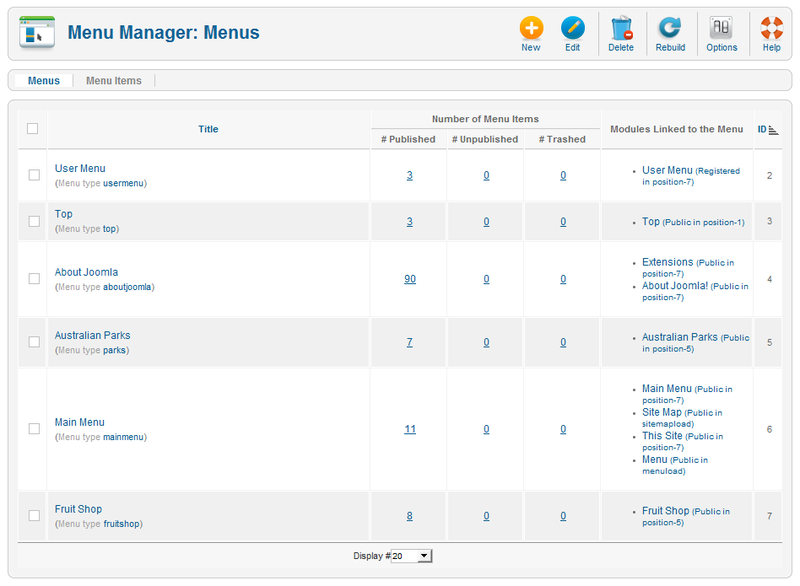 Lists any menu modules associated with the menu. The column shows the module's name, access level, and position on template. Delete. To delete a menu (and all included menu items), select the checkbox, and then the "Delete" button. You will be given one last chance to change your mind. If you're sure you want to delete the menu, click the delete button one last time. Rebuild. Reconstructs / Refreshes the menu table. Normally, you do not need to rebuild the menu table. This function is provided in case the data in the table becomes corrupted. Options. Opens the Options window where default permissions for Menus can be edited. See Menus Configuration. The Main Menu has your default menu item, so it should not be deleted. The default menu item is your home page, and your site will not function if it is deleted. If you change the default menu item, make sure that you don't delete that menu item either! The menu with the default menu item is marked with an asterisk (*) in the Menus menu.